The purpose of this website is to provide material supplementary to the update review (not yet published) of the 1993-published autism theory paper (linked in header above). All the posts here serve that purpose in one way or another, but some are more worthwhile or necessary than others. So here is a brief guide to the contents here. Click here to read discussion of whether there is a relationship of vaccines to autism. "Skeptical" people will generate plenty of supposedly clever reasons for rejecting the whole basis of the antiinnatia theory. That's despite the fact that any such "skeptics" must therefore be instead gullibly taking seriously one of a handful of utterly absurd alternative theories as explained in the update paper. An answer to one of these "skeptical" notions is this one about being supposedly impossible for mercury to get to the DNA. And this one about supposedly the history of Pink Disease (acrodynia) proving that mercury doesn't cause autism. But perhaps you're a sheep? Autism research is now becoming seriously distorted by official charlatanism similar to that of which the proof is shown here. And that distortion directly affronts the truths to which this theory relates. One of the leading sources of extreme misinformation is the book by Paul Offit, which is being distributed free to parents of victims via the American Academy of Pediatrics. are all addressed in the articles linked above and therefrom (and more fully in conjunction with the update review paper). Turning to less militarised corners of the autism research field, I'll first point out that theories are often not in conflict even when they superficially may appear to be. And there is only one autistic/ASD/etc syndrome, not several or many "autisms". You can find the link to the spectacularly-predicted Purgatorius video here, along with some further evidence relating to my explanation of the hand-flapping. Some other peoples' excellent graphs of the increase in the US can be found here, particularly the ones with multiple differently-coloured curves. They basically confirm my interpretation of the California DDS data as essentially a simple exponential-shaped increase. Here is a link to my comment on close-spaced pregnancy findings of Keely Cheslack-Postava, Kayuet Liu, and Peter S. Bearman. I've added yet another amazing new prediction, that the Flynn Effect (rising IQs increase) affects non-human animals as well. Mitochondrial dysfunctions could be caused by antiinnatia (both within and without the brain), or they could be a non-antiinnatia "side effect" of mercury toxication. They could be part of some processes whereby antiinnatia affects neuronal function. So the reports about mitochondria appear to give neither support nor challenge to antiinatia theory. Data on a "photoninthedarkness" blog leads me now to thinking that the increase has involved some diagnostic substitution, but not in the way that is assumed by pro-vaxxers. More later, but I reckon when there was a rapid real increase of autism c. 1985-1995, much of it was incorrectly diagnosed as non-autistic retardation. 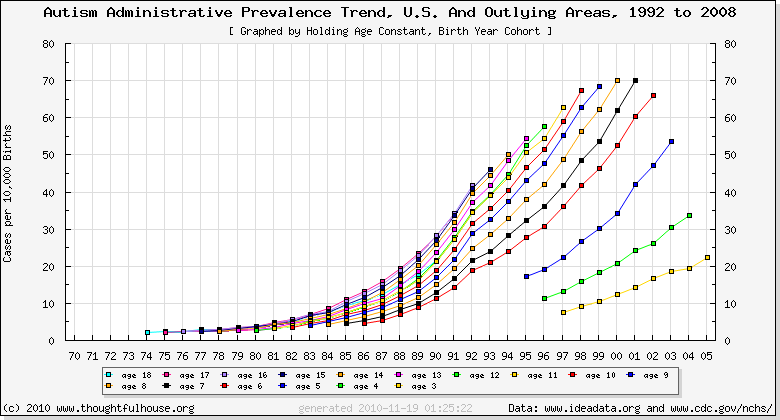 Thereafter the diagnoses substituted to the correct autism diagnoses. This leads me to suspect that the autism increase actually stopped increasing about ten years ago and since then it's just been an artifact of substitution. “We’re finding that the immune system seems to function at a lower level in autism,” says Hertz-Picciotto. Which could be because the dental mercury that caused the autism increase is well-known to also impair immune functioning. July 2011: Powerful yet further evidence of mercury involvement in autism - 6-fold increased autism in children whose grandparents survived Pink Disease.